Last year the launch of the Models Own Beetlejuice collection caused quite a stir in the beauty blog world… I do love a good duo-chrome polish, they turn me into a bit of a magpie with their pretty sparkly colourful-ness. Then this year the brand added three new polishes to the collection – of which only one was really a stand out for me, Indian Ocean. It’s a stunner. The other two, ‘Tropical Sun’ and ‘Copper Pot’ are nice, but to me – not really on the same duo-chrome level as Indian Ocean. In the promo picture (below) they looked far more duo-chrome then they are in real life. I tried to capture the gorgeous pinky shimmer, but it wasn’t easy – the picture with flash is the closest I could get. But this really is a gorgeous polish – in different lights you can see the different shades, sometimes its the fresh blue shade (boosted by the base colour) and in others you can see a silvery shimmer with flecks of pinky/purple and in others the pinky purple shimmer really shows. Of the three new shades in the collection, to be this one is a must have. Pretty, i picked up Purple Blue and Copper Pot. I think i will have to go back for Indian Ocean. Oh my days I have never seen the Copper Pot one and I WANT!!! 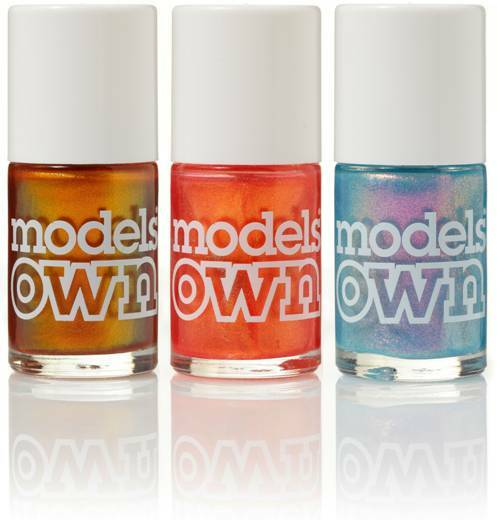 I love these shades from Models Own at the moment, very envious of you!!! Is the colour dark/thick enough to wear without a coloured based beneath? I completely know what you mean by ‘sky blue pink’, heh. Sounds gorgeous, and from what I can see in your pictures, it looks amazing too!